I just love, love, love, this beautiful Bookshelf wallpaper designed by Young & Battaglia. The Bookshelf wallpaper has a vintage library look with shelves of old books. 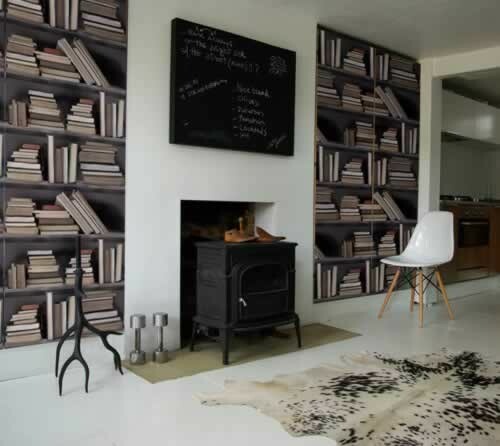 The wallpaper will create an eye-catching feature which is timeless. The Bookshelf wall is designed by Young & Battaglia and made in England. The delivery time for the wallpaper can be up to 2 weeks. If you require it urgently, please give us a call on 01444 253391. Please note if you are re-ordering it is the customer's responsibility to let us know the batch number required. Express Service: If you require a speedier delivery for your wallpaper please call 01444 253 391 or email contact@rockettstgeorge.co.uk to discuss stock and express delivery options.